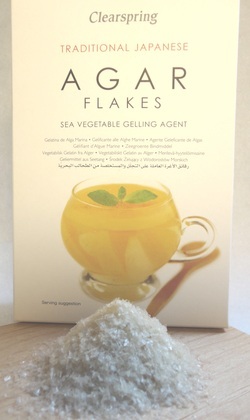 Agar flakes can be used as a vegan gelling agent. They are made from seaweed, but fortunately they don’t taste like it. Unlike gelatine, agar flakes need to be boiled in the liquid you want to set. This limits their use a little. However, agar sets faster than gelatine – which is always a positive when you’re waiting to tuck into your treat! To make a basic jelly, use 1 tbsp of agar flakes per 200 ml (7/8 cup) of liquid. This will give you a firm jelly. This is the ratio I have used in the Simple summer berry trifle recipe. If you’d like to make a softer, more wobbly jelly, use slightly less of the flakes. This is what I did, for example, in the Cinnamon pannacotta recipe in the No Naughties at Christmas book, as pannacottas are meant to be soft. You can buy agar flakes in health food shops and some large supermarkets where they’re often stocked on the same shelf with Japanese foods. Copyright © Tarja Moles 2013. Photograph © Tarja Moles 2013. All rights reserved.